I’ve been jonesing for this stuff for the past few months and somehow managed to fight the urge to buy zucchini out of season. Not sure how I managed it, but I did. Now that my garden is going crazy, here’s a nice little zucchini recipe for y’all. I served mine up with some clean BBQ sauce that’s made locally here in Portland. They’re delicious just by themselves but this sauce. It’s an addiction. In a medium skillet, heat the coconut oil over medium heat. Test out a bit of egg to see if the skillet is done – you want it to start spattering immediately. You’ll need a bowl and a plate – one for the egg and one for the almond meal. Beat the egg in the bowl until it’s well blended. On the plate, combine the almond meal, salt and pepper and sift with a fork until incorporated. Dip the zucchini in egg, then in the almond meal and once again in the egg and place in the frying pan. Repeat until the pan is full with a single layer of zucchini. Cook until the egg is done and golden brown. Remove from pan and put aside. Repeat until all zucchini has been cooked. I’ve had a hankering for some good Polish hunter’s stew. Unfortunately, the main ingredient is sauerkraut and I have none… so this hankering is going to have to wait. 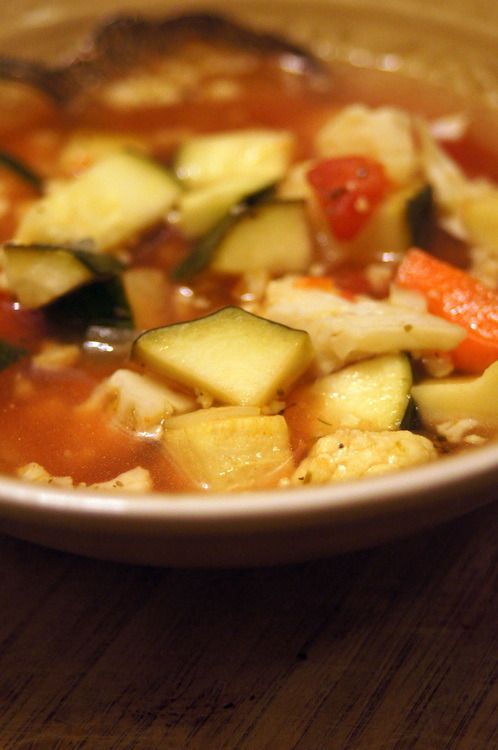 Oh well – in a few weeks, you’ll see a post for the best stew that will get your blood flowing again. Seriously. It’s that good. And it has 3 kinds of meat in it – mostly bacon. 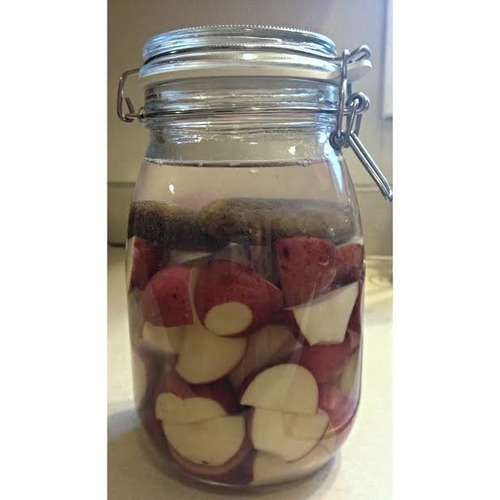 I outlined the necessary supplies on my fermented red potatoes post so check that out before you start. If you want more information about why sauerkraut is good for you, check out my Latin American sauerkraut recipe. 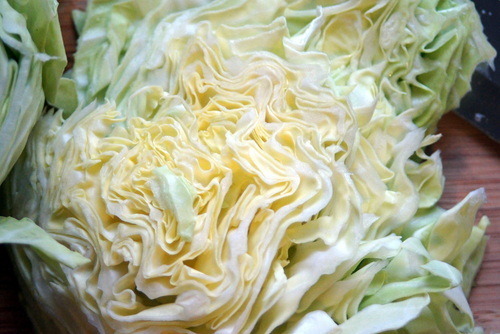 Also, when you go and buy your cabbage, don’t waste your money on the organic stuff – cabbage is one of the Clean 15. Going to WinCo or some other bargain grocer and spending $.50 per pound is perfectly acceptable and it’s what I do! That makes two liters of finished sauerkraut cost me about $5 total. I can buy a pint and a half of raw sauerkraut at the store for $10. Umm – yea. I’ll take my deal any day. In a large bowl sturdy bowl (I use a massive stainless steel bowl), mix all of the ingredients. 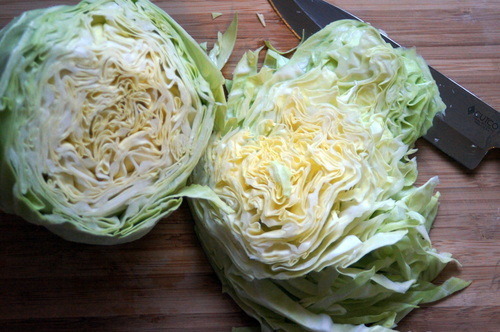 Now comes the fun part: Pound with a wooden pounder or meat hammer for about 10 minutes, until the cabbage starts juicing well. You will see it becoming more and more wet as the time goes on and when it is finished, you will be able to squeeze some in your hand and have the juices run between your fingers. 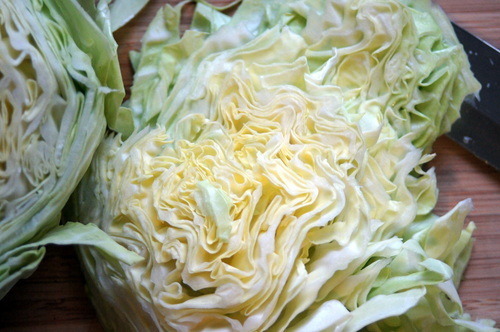 Place in 1- or 2- quart, wide mouth mason jars and press down firmly until juices come to the top of the cabbage. Do this in small increments, making sure to have all of the air bubbles pressed out. Stuff one of the saved whole leaves down around the cabbage, being careful not to rip the leaf, to get out all air bubbles and to keep the mash down below the juice level. Using a clean, round and flat river rock (not bigger than the mouth of the jar) or a glass dunker, place on top of the whole leaf and push down. This will keep the mash below the juice level for the whole fermenting process. It is okay if the top of the rock or dunker is above the juice a little bit. With a clean rag, clean the lip of the jar and place the lid on the jars and let sit on the counter for 14 days (after three days, there will be bacteria growth and after 14 days, there is a more complete panel). A cool place (65 degrees Fahrenheit) is best as the warmer temperatures help bad bacteria grow. Place in the refrigerator and let sit for an additional week – do not open during this time. So, your kraut will have fermented for three weeks total. Open jars once a day during the sitting-on-counter phase to allow gas to escape. Sauerkraut will keep indefinitely in the fridge. Enjoy! Note: If the sauerkraut doesn’t smell sour, pickle-y, or kraut-y or is growing black sludge, toss it out! You’ll know if it smells bad (as in going to kill you). 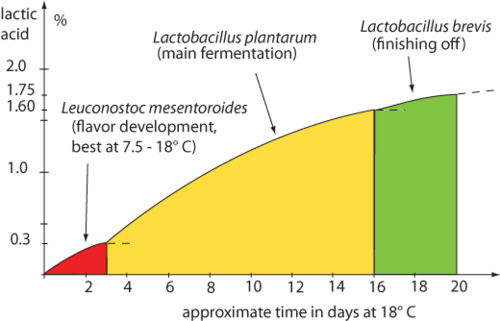 Lacto-fermentation, what this process is called, is very very safe. However, there are times where the tools are not clean and bad bacteria gets in. The best way to prevent this is to use a clean workspace and a clean jar. As always, wash your hands thoroughly prior to beginning. 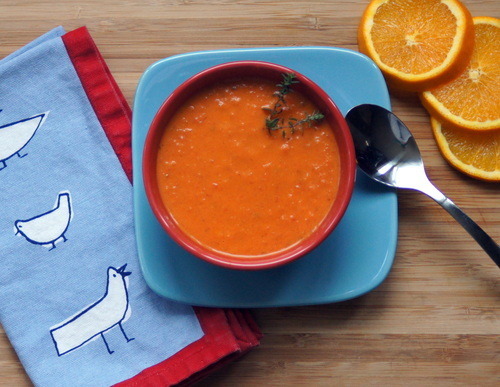 Stormy weather can only mean one thing: soup that’s bright and fresh. And this one won out. I had all the ingredients on hand and didn’t need to run to the store – always a major victory in my book. This dish can easily be made paleo by substituting the butter for coconut oil and the cream for full-fat coconut milk. I made today’s batch with coconut oil and pasture-raised heavy whipping cream. There is a farm in Mulino, OR that I like and the local market sells it. Their cows are raised well and their cream is fantastic. It’s not raw, unfortunately, but it’s also non-homogenized. I’ll take some victory where I can get it. And once in a while, it’s a nice treat. The inspiration for this recipe is from Elephant Delicatessen, a Portland-based deli. 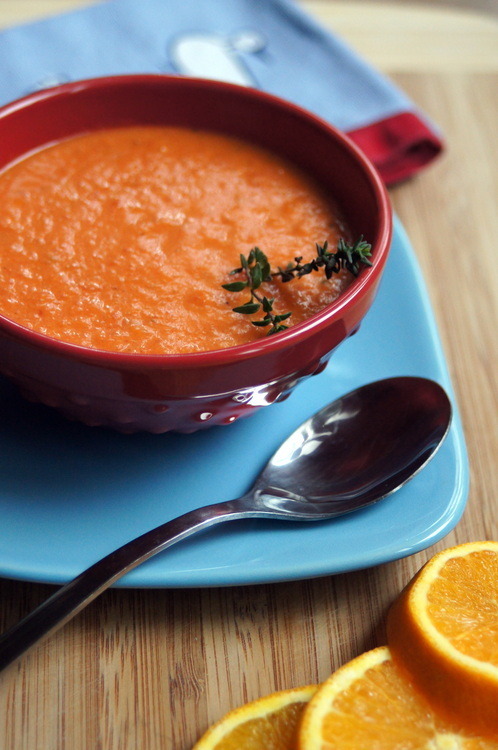 Their bisque is city-famous and has never disappointed. 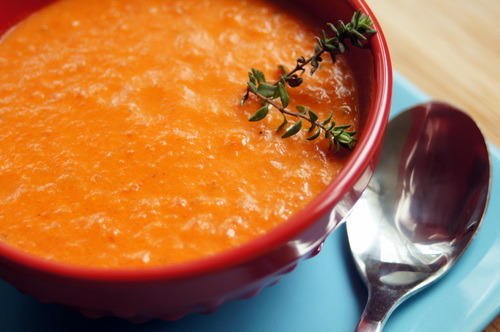 A little note: You can transfer this soup to a blender and blend it that way… but I hate doing that. Hot things splashing around and the risk of burns do not sound like a lot of fun. 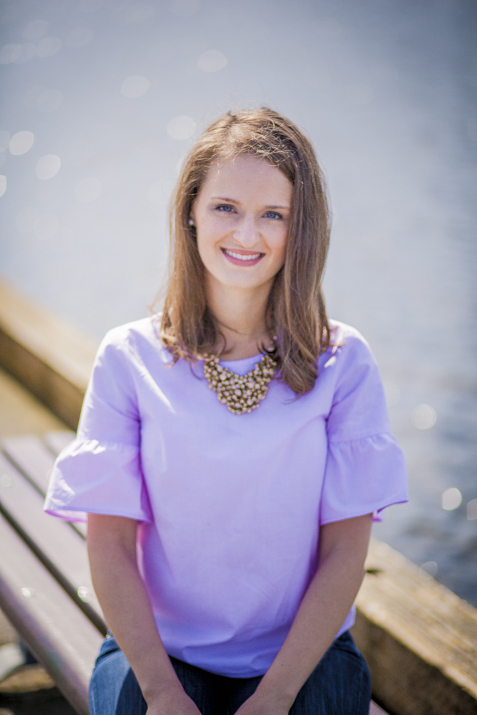 (You’re reading the blog of a girl who once dumped boiling water on her stomach on accident…. so yea. I’m paranoid. And a bit accident prone.) I bought a handy-dandy immersion blender a few years ago. It’s saved me. 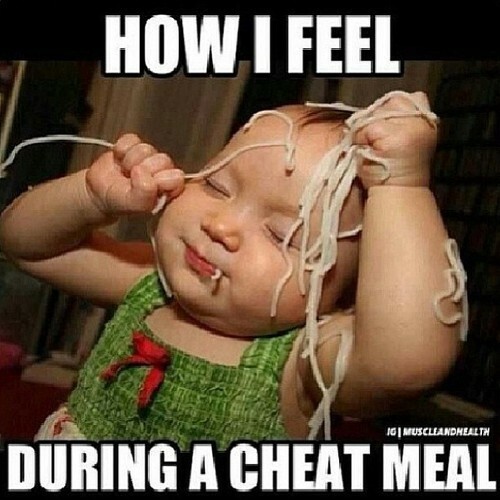 And my stomach (literally) a few too many times. If you’re wondering how you’re going to afford one, a month of no Starbucks venti whatever-it-is-you-drink will quickly cover the cost. (And save your stomach – Starbucks. Really? Ew.) They can be found on Amazon here or at any store that sells kitchen tools. When I bought mine, they only had chrome. If I was able to do it over again, I’d totally get the turquoise. On a serious note, it’s a must-have for any paleo or primal foodie… or anyone who values not having a second-degree burn (and I still have the small scar to prove it… not that I will). Melt the butter (or coconut oil) in a stock pot over medium heat. Add onions and saute until the onions are translucent. Add tomatoes, salt, black pepper, baking soda and thyme. Bring to a boil. Lower heat to a simmer and cook uncovered for 15 minutes. Using an immersion blender, puree the soup in the stock pot. Add orange juice and whipping cream or coconut milk. Bring to a simmer, adjust flavor with salt and pepper. Potatoes. They are my guilty pleasure in life. I love love love good French fries. I love skillet potatoes. I love the roasted potatoes you get with breakfast at Mother’s Bistro in downtown Portland. And kettle chips? Forget it. I’m a goner – and so is that bag. Unfortunately, they don’t love me and usually make me (and my sister) ill. My mom was doing some research a while back to find out why her two favorite daughters became ill after eating potatoes. And here’s what she found. Acrylamide has probably always been present in some foods, but this wasn’t known until Swedish scientists first found it in certain foods in 2002. I can’t blame GM foods for this one, fair enough. Acrylamide does not appear to be in raw foods themselves. It is formed when certain starchy foods are cooked at temperatures above about 250° F. Cooking methods such as frying, baking, broiling, or roasting are more likely to produce acrylamide, while boiling, steaming, and microwaving appear less likely to do so. Cooking at high temperatures causes a chemical reaction between certain sugars and an amino acid (asparagine) in the food, which causes acrylamide to form. Longer cooking times and cooking at higher temperatures can increase the amount of acrylamide in foods further. This isn’t something that only affects a small population and I’m the unhappy recipient, it apparently reaches everyone but only a small population really really have a reaction. Example A runs this blog. And then upon reading further, my mother found out that fermenting the potatoes, or soaking them in salt water for three days, seriously reduced if not all together eliminated the occurrence of acrylamide. Thus making them safer and easier to digest. Crazy, right? On another note, this is something that my ancestors in Ireland would have done (shameless Irish heritage plug: Éirinn go Brách!) – they would have soaked their potatoes overnight in a salt water brine, not knowing the science behind the why (that wasn’t discovered until 2002), but knowing that it reduced bloating, gas, general GI discomfort and any other allergic reaction that acrylamide causes. I bet at this point you’re wondering what is going on behind the scenes, at the small organism level, right? Or is that just my science nerd brain at work? (Btw, great science fair ideas here) You’re growing your own bacterial colony. Gross, right? It’s called wild fermentation and it’s fabulous. Over the course of the next few days, the bacteria that occurs naturally on the potatoes (so don’t scrub too hard or use antibacterial soap), will go to town eating the starch and turning it into other stuff that our body can use more readily. They’re basically starting our digestive processes before we even eat it. Again, ew. But it works. And this is what generations did before we were on this earth. Anyway, the bacteria – the saltwater brine keeps out mold and the bad bacteria and yeasts. We only want the good guys in there. A scale that measures little itty bitty amounts. I like this one. In a glass measuring bowl or something where you can measure out a quart of water, do so. Pour the water in and set aside for at least 30 minutes. Scrub the taters. Cut off any eyes, the stem part and any part that just looks funky. Chances are it is funky. And no one likes funky. Toss the spuds in the CLEAN jar (that’s right, you need to wash it and sanitize it – but do not use anti-bacterial soap, instead send it through the dishwasher for a cycle). Measure out 33 grams salt. Yes, that’s 33 grams. One more time: 33 grams. You’ll have to adjust your scale to zero out for whatever bowl you have sitting on top. But, again, 33 grams. Once the water has been sitting out for 30 minutes, toss the salt in and stir until dissolved. Add to the canning jar with the ‘tots. Seal the lid, place a dunker (I use river rocks that I found, scrubbed and sent through the dishwasher to ensure all dirt was gone) and let it sit. For three whole days. So, if you want potatoes for brunch on Sunday (because I live in Portland and brunch is the best meal of the week), you need to put them on Wednesday night or Thursday morning. Get it? If you don’t have three days, it’s okay. Even overnight will help out a lot. But three days rids the spuds of every single bad thing. Place it in a cool place… or on your kitchen counter – they look pretty. When you’re done, and this is important, place the potatoes in a colander and rinse thoroughly. You’ve pulled the starches and any other toxins that they have in them. They have got to go. Also, you’ll notice a “sludge” at the bottom – this is the starch that’s been pulled from them. Ew, right? After they’re rinsed, they’re good to go – you can cook them any way you would cook regular potatoes. Pretty fancy, eh? I personally like to roast mine with bacon fat (mmm – bacon) and kosher salt and pepper until they’re crispy on the outside and soft on the inside. So when I tried their new salad dressing, I was hooked. Except that it was a bit too sweet and a bit too salty for my taste. Also, they used adobo sauce – which sometimes contains gluten due to “natural flavors.” There was only one thing to be done. Make my own. So I did. And it’s fabulous and my new favorite. 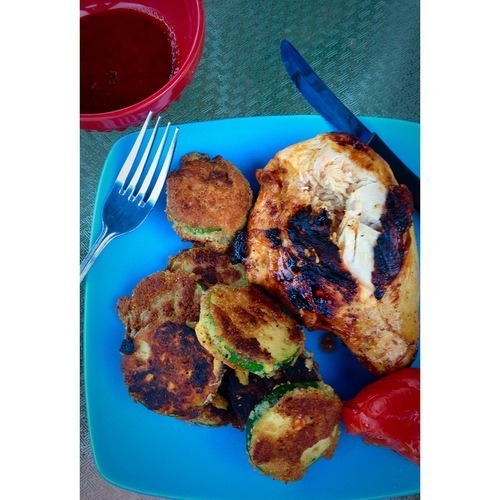 I really want to try it as a wings marinade next – tailgating season is right around the corner! Mix all ingredients in a blender or using a hand mixer, slowly drizzling in oil at the end. Or, do what I do and put everything in a mason jar, seal with a rubber-rimmed lid and shake it like crazy until the honey is dissolved. Note: Ingredients will separate between use and it can be stored in a sealed container for up to two weeks in the fridge. 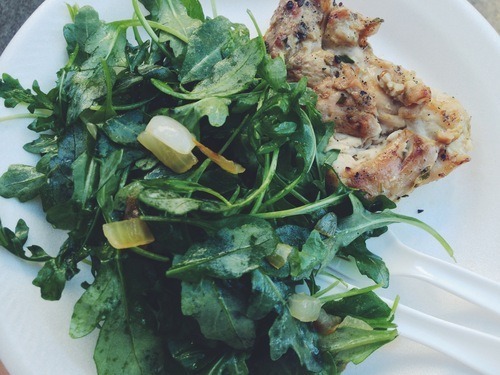 My naturopath has me on a new diet… and it zapped my energy times a million until today. I might even get a short run in. Thankfully, this one is a 10 day crash course and then I can start getting back to normal. And by “normal,“ I mean a less-restricted paleo. In the meantime, no bacon (WHAT?! ), no vinegar (HECK NO!!!) and no fruit/chocolate/wine/decaf coffee/hard cider/gluten-free beer/honey/paleo brownies/coconut milk ice cream/all things that bring my life joy. So. You’re probably wondering, “What CAN she eat?” I’m glad you asked. Meat. As long as it’s not pork or bacon. And green leafy veggies. Like arugula, broccoli, cauliflower, zucchini and cabbage. And nuts/nut butters/coconut oil/coconut butter/olive oil. And really, that’s about it. Sounds daunting, doesn’t it? It’s mostly paleo. But I love to make my own salad dressings… and they have vinegar. Or I’ll have half an avocado with my breakfast – and that’s off the list. And no eggs. None. So… what does one eat for breakfast if there are no eggs and bacon? Today it looked like a few cucumbers and a handful of almonds. I need to figure this thing out. Luckily, it’s only a week and a half to two weeks. And thankfully, lunch was easy to figure out – roasted chicken breast (salt and peppered) and roasted cabbage (hoping the doc says that roasting veggies is okay otherwise, I’m just going to get a nasogastric tube for the rest of this time). Anyway, done complaining. 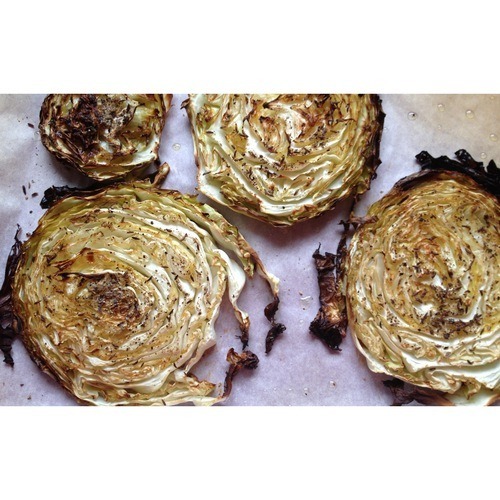 I hope you enjoy the roasted cabbage as much as I do! Preheat the oven to 400 degrees Fahrenheit. Place a piece of parchment paper on a jellyroll pan (cookie sheet with sides). Pour enough EVOO on the parchment to spread evenly on the parchment paper. 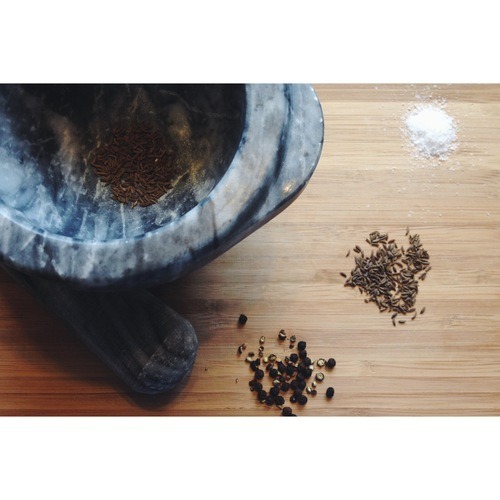 Using a mortar and pestle (or something that will smash up the spices), smash up the spices and set aside. 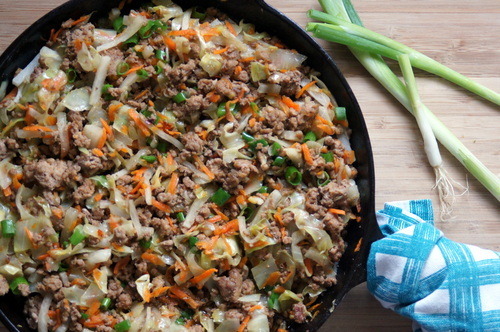 Sprinkle half of the spice mix on the pan and lay the cabbage in a single layer on the pan and sprinkle with the remaining spice mix on top. Bake for 15-20 minutes. Remove from the oven and serve hot.